Ba Be Lake which is an incredibly beautiful area boasting waterfalls, rivers, deep valleys, lakes and caves set amid towering limestone peaks. This lake, though less visited than other national parks, has been recognized as the third Ramsar in Vietnam. 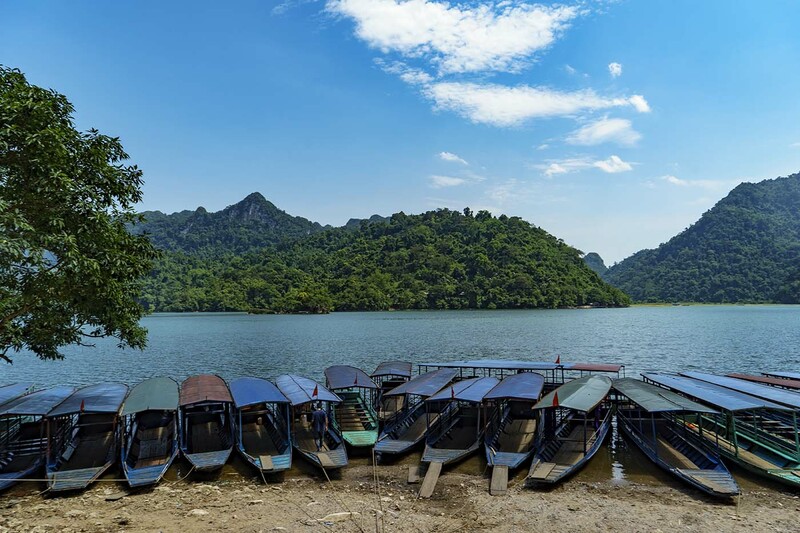 The National Park includes three interconnecting lakes which can be explored on a private long tail boat. The locals are from the Tay minority people, who have adapted their lake side stilted homes to offer comfortable rooms for visitors. Your tour continues north to Dong Van Plateau. You will visit the small communities of Quan Ba, Yen Minh and Dong Van, some of the most picturesque villages in the northern tip of Vietnam. Next, you’ll then drive to Cao Bang, an area of incredible scenery, including mountains, grottos, rivers and waterfalls. 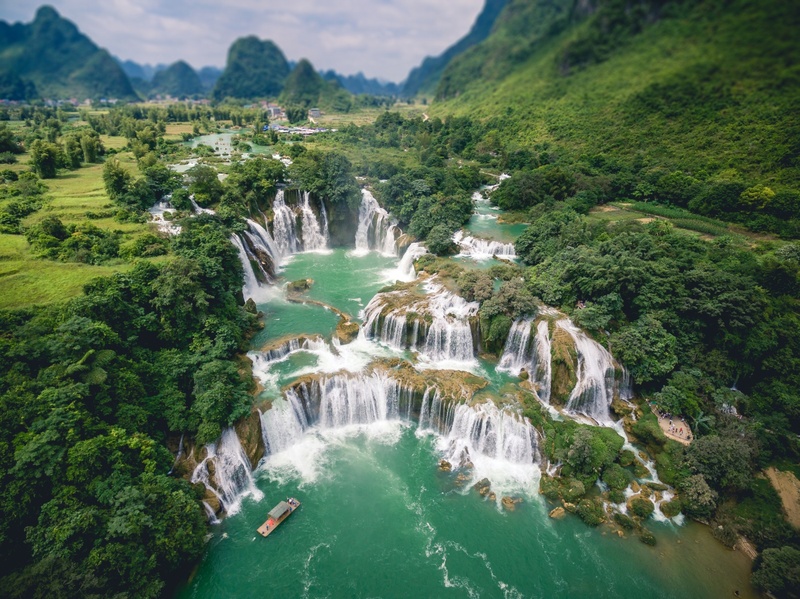 You’ll visit the Ban Gioc Waterfall on the China-Vietnam border, 85km from Cao Bang, passing through spectacular scenery en-route. You’ll also visit Halong Bay for a memorable adventure on one of the most beautiful bays of the World. You can engage in kayaking and cave climbing, but you will also relax in style on a wooden junk featuring twenty luxurious cabins furnished in classic Eastern style. A truly memorable experience awaits passengers as you cruise this delightful bay, reveling in its tranquility and natural beauty. + Cast away on a traditional junk boat and set sail through hundreds of limestone karsts that rise dramatically from the emerald waters of Halong Bay. With an early departure from Hanoi this morning, you’ll head north to Ba Be Lake. This drive of 270 km will take approximately seven hours. 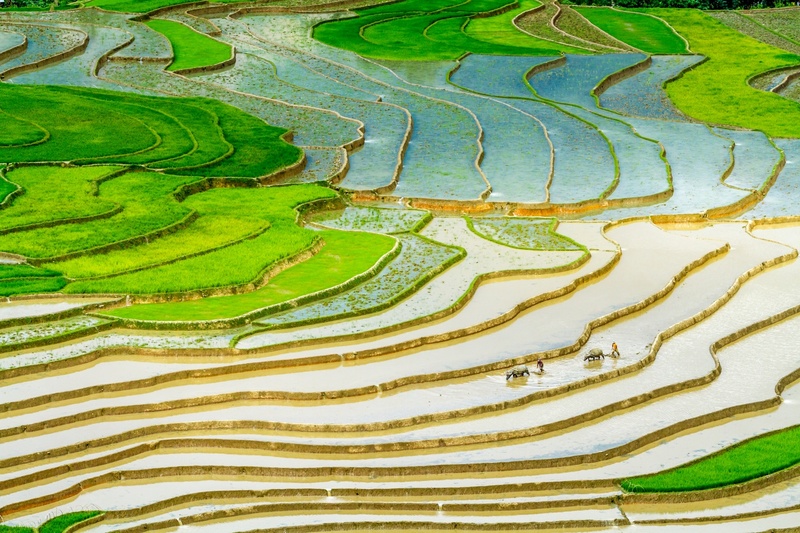 You will travel through the flatlands of the Red River Delta and up into the mountain areas north of Hanoi. As you progress north, the scenery becomes more and more picturesque. From your scheduled lunch stop, it is only about two and a half hours to your destination. Arriving in Ba Be town by mid-afternoon, you will check in with your Tay host family, and then stroll around the village before sunset. You will spend the night in a traditional house on stilts. 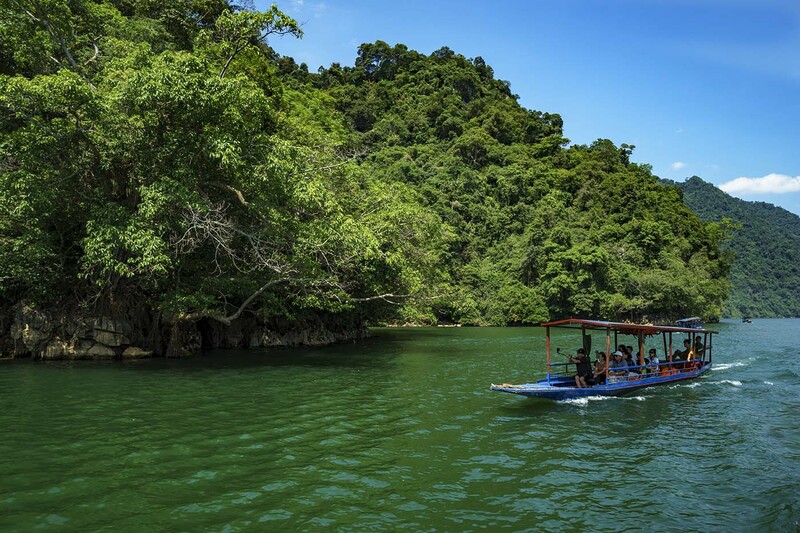 You’ll have a full day to visit the park, starting with a boat trip through Puong Cave. You’ll visit the Fairy Pond, located in a dense forest with a variety of birds, and the Dau Dang Waterfall. In the late afternoon, you’ll disembark at a Tay ethnic minority village to spend the night. 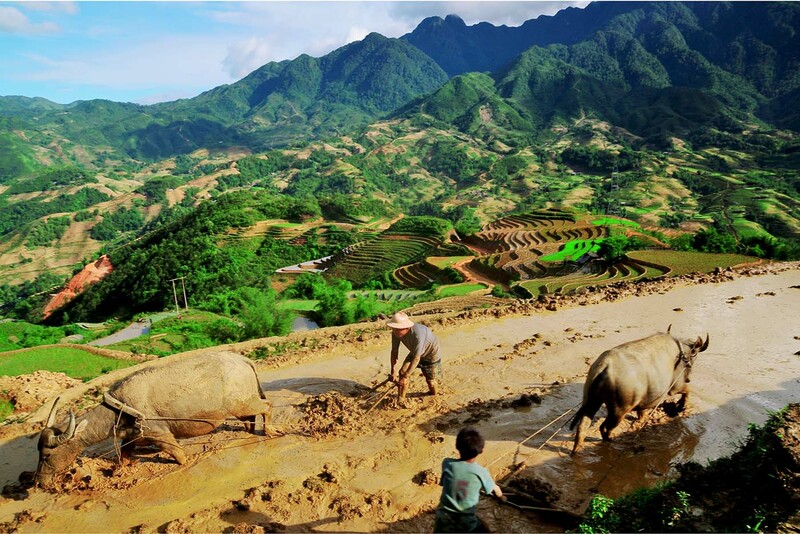 Today you’ll drive to Ha Giang, a province in the far Northeast of Vietnam. Your route will take you through mountainous landscape and striking scenery. You’ll arrive at Ha Giang in the afternoon. 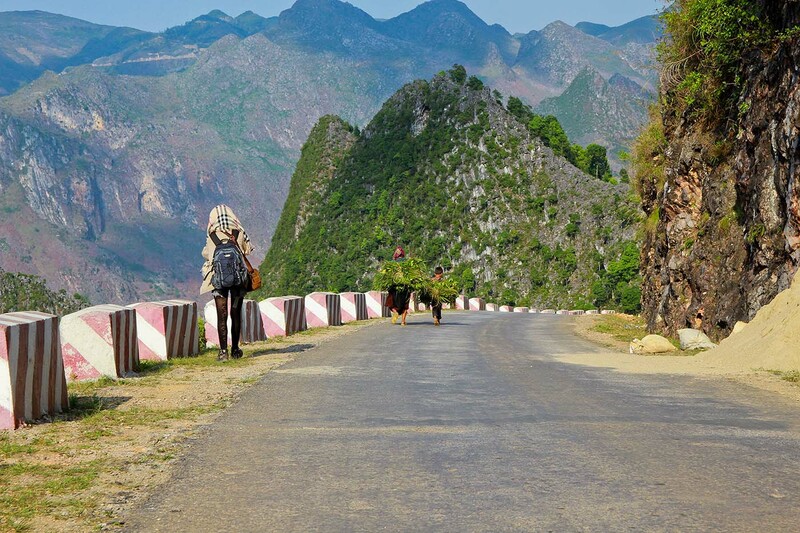 After checking into your hotel, you’ll have rest of the day to wander along the Lo River and the rest of the town, or just relax after your journey and have a restful overnight stay in Ha Giang. After breakfast, you’ll visit the small communities of Quan Ba, Yen Minh and Dong Van, some of the most picturesque villages in the northern tip of Vietnam. The scenery is spectacular, including a vast limestone mountain range and perpendicular walls of rock. You’ll stop at the Vuong Palace, once the home of a high-ranking H’mong family during French colonial rule. The palace attracts architecturally minded visitors due to its unusual combination of European and Chinese styles. From there you will drive to Dong Van where your guide will show you its charming ‘Old Streets’ near the market. You will spend the night in Dong Van. After breakfast, a scenic route will take you to the Ma Pi Leng Pass where you can enjoy a panoramic view of the Nho Que River. A morning drive will take you through more passes before you stop for lunch in a small town. In the afternoon, you’ll arrive in Cao Bang to check into your hotel. After breakfast, you’ll visit the Ban Gioc Waterfall on the China-Vietnam border, 85km from Cao Bang. Ban Gioc is one of the largest and possibly the most impressive waterfall in Vietnam. You can swim in the cool waters below the falls or simply enjoy the pleasant surroundings and views across to China on the opposite side of the river. In the afternoon, you’ll visit Nguom Ngao, one of the largest caves in the area. It has many fascinating shapes and stalactite formations. You’ll then spend the night in Cao Bang. Today you will leave Cao Bang for Halong Bay, via Lang Son, stops to visit Dong Khe & That Khe. After lunch in the border trading town of Lang Son, you will continue to Halong Bay and check in for an overnight stay in Halong. You’ll be free in the morning to explore Halong Bay City and in the afternoon you’ll board a wooden junk to take a cruise through the Bai Tu Long Bay area. You’ll then continue your cruise and visit a cave and hidden lagoons in a tender or a kayak. The route is designed to avoid the busy areas and includes a very quiet location for your overnight stay. For your two-day Ha Long excursion, you’ll board one of the best quality boats on the Bay, a wooden junk based on the model of the old Vietnamese court vessels with sails, a wide transom and rectangular superstructure. The boat has five cabins, accommodating up from 10 people, so you’re likely to be joining other travelers for the cruise. Your cabin will be about eight metres square, and furnished with twin or double bunks, two fans, an air-conditioner, pillows, white cotton sheets, and an en suite toilet and shower. All your meals, consisting largely of fresh seafood will be served on board and you’ll stay overnight on the boat. 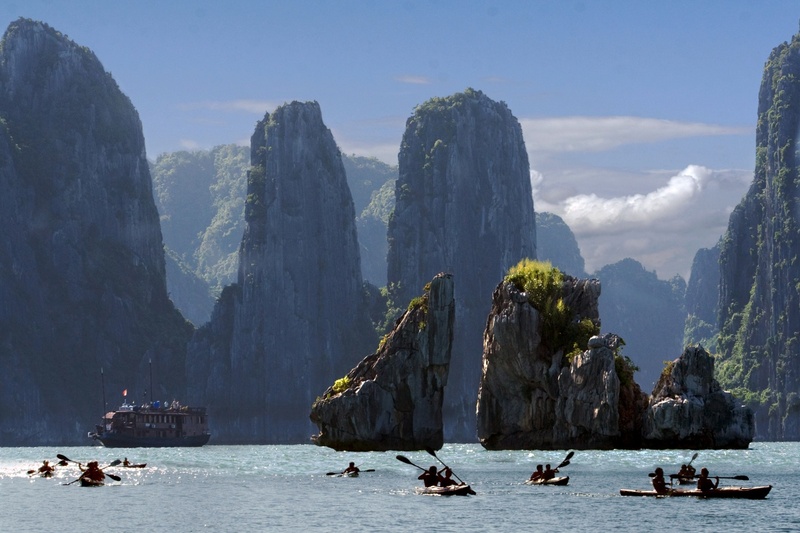 You’ll spend the morning cruising Ha Long Bay and visiting a fishing village on a sampan. You’ll have the opportunity to explore the village, followed by lunch, before docking around noon and heading back to Hanoi where you’ll arrive at 4 pm. We designed this tour programme with focus on the Northern and North-eastern mountainous areas of Vietnam where photographers, amateurs or professionals, will encounter breath-taking natural landscapes, colourful ethnic minorities and authentic experiences all year round. 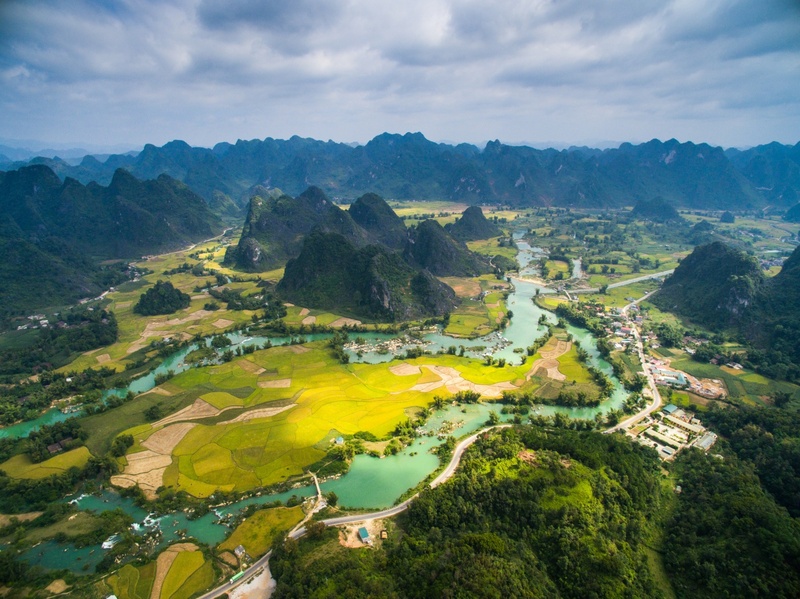 Vietnam’s northernmost province of Ha Giang offers some of the most striking sceneries with the rock formations and bizarre landscape in Dong Van rock plateau, a UNESCO World Geopark. 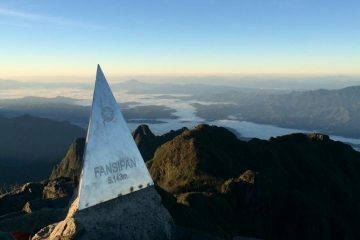 Other highlights of the tour includes the beautiful Ban Gioc Waterfall on the Sino-Vietnamese border and Ba Be National Park with homestay and kayaking on Ba Be Lake, one of the rare karsts mountain lakes in the world which never dries.